Are you guys ready for another haunted painting in our worlds most haunted object series. Of course you are, I love these haunted, possessed, creepy painting stories, and I am sure most of you guys do to. Today we are going to uncover the mystery behind “the eBay haunted painting”, also known as “the hands resist him”. In 2000 and anonymous eBay seller listed a painting called “the hands resist him”. This painting is now considered to be one of the worlds most haunted works of art. It didn’t take to long for the painting to sell on eBay. The painting was bought by a very nice Californian couple. Now just a couple of weeks later the nice couple from California put this painting right back on eBay with a warning. They wanted to let all the potential buyers know that this painting was haunted. According to the couple the children in the painting moved around within the canvas at night. Sometimes they would even disappear entirely from the painting. The boy in the painting was said to actually enter the room where the painting hung. Most of their friends who viewed the painting had to leave the room as they felt very dizzy and sick. For those who could view the painting long enough they felt as if unseen hands where touching their body. After the couple posted this painting on eBay with their very detailed warning, it didn’t take to long for people to take notice. Eventually the painting was sold to an art gallery in grand rapids Michigan. Now the question remains did the couple just make up these scary, crazy out of this world story’s to get more money. 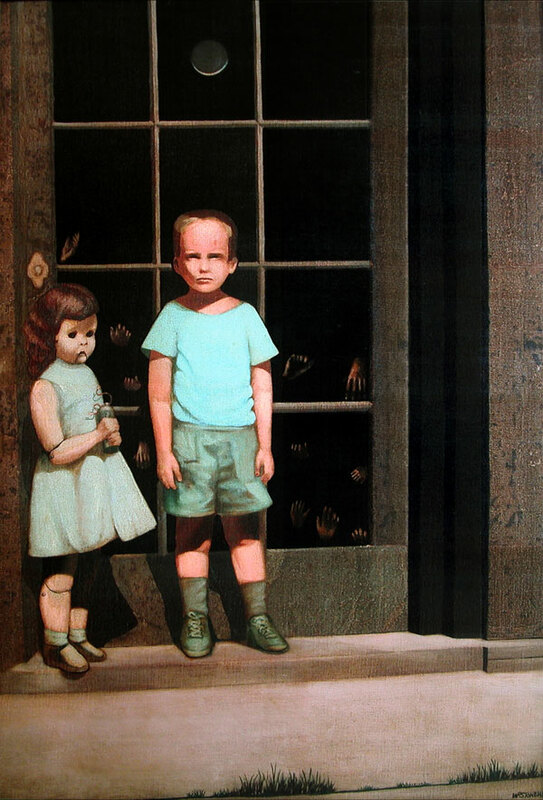 Or is “the hands resist him” painting really haunted. I guess the only way for us find out for sure is to head down to the art gallery in grand rapids Michigan and find out for ourselves. Untill next time this is paranormal junkie, make sure to subscribe and stay tuned!